THE RIGHT STRETCH IN THE RIGHT PLACE. What makes the Velocity Series of wetsuits special is the combination of three different full-stretch material types. We call this concept PROGRESSIVE FULL-STRETCH and it is only available in the Velocity Series. 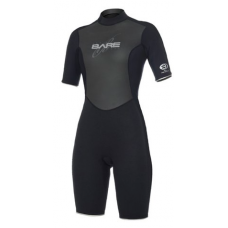 It all starts with BARE-FIT, which is the foundation of every BARE suit. BARE-FIT uses ergonomic suit design involving complex shaped patterns with articulated arms and legs. From there, zones associated with performance within the suit are selected. Then, proven full-stretch fabrics are chosen from various prototypes that have been tested for years. By placing the different fabrics in particular panels of the suit, the Velocity Series delivers exceptional fit, feel and performance.